Having constructed the Classical Model it is time to take it for a spin on the public policy highway to see how it performs. The first step is to introduce government as a player. Until now only firms and workers (consumers) were active players in the model with government barely visible as the monetary authority of the country. Now government enters acting both like a consumer, that is, buying output from firms, and like a firm taxing consumers that is, in effect, the ‘price’ of public goods, e.g. roads, sewers, schools, etc. As a player in the model government practices both fiscal (tax and spend) and monetary policy. 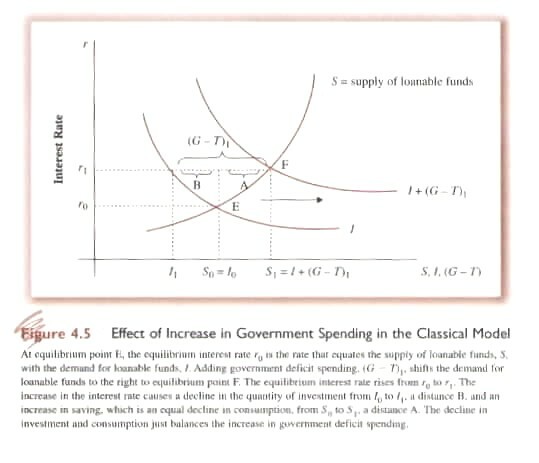 We will first look at fiscal and then monetary policy and their effects on the Classical Equilibrium (Fig. 3.6, p. 55). 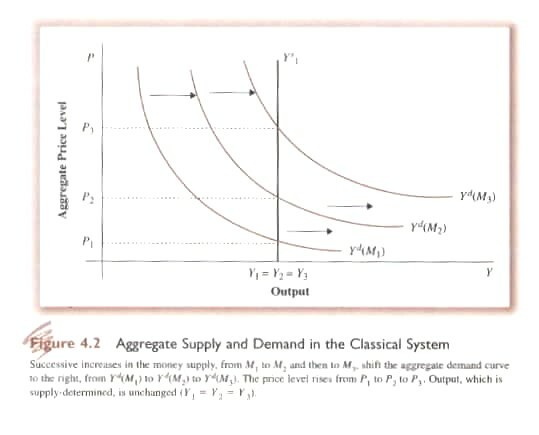 In the Classical Model we have seen that aggregate supply is determined only by ‘real’ factors, e.g. the real wage and the marginal productivity of labour assuming, for example, a fixed capital base, fixed technology and a fixed population. Changes in ‘nominal’ factors such as the money wage, prices and money have no ‘real’ effect on the Classical Equilibrium. Price, money wages and the money supply may vary but real output and real wages stay the same. Similarly government when it acts like a consumer (spending policy) does not affect the equilibrium but rather the distribution of demand. Assuming the budget is in balance, that is, government spending equals tax revenue (G-T=0), then consumer income is reduced to ‘disposable income’ by the amount of taxes levied while government spending exactly matches this decrease. Real output and employment are not affected. If, however, spending is greater than taxes (G-T > 0) government is in a deficit and must raise funds in one of two other ways – borrowing or increasing the money supply. And if taxes are in fact increased to pay for higher levels of government spending the impact will varying depending on their demand- vs supply-side effects. If government borrows from the supply of ‘loanable funds’ available from workers it increases the demand for such funds and forces interest rates up (Fig. 4.5, p. 72: shift from I to I + [G-T>0]). At the higher interest rate (r0 to r1) consumption declines because the return on savings increases, that is the supply of loanable funds increases. The decline in consumption, however, is exactly offset by the increase in G. Therefore the Classical Equilibrium is maintained. Higher interest rates, in turn, reduce borrowing by firms for investment purposes, that is, government borrowing ‘crowds out’ private borrowing (Fig. 4.5: at r1 private investment declines from I0 to I1). Again the Classical Equilibrium is maintained in that increased government spending matches decreased private consumption and investment. Economic growth, however, may be affected. Private investment increases the capital stock leading in subsequent periods to a higher level of output. If increased spending by government is used effectively and increases the public capital base, e.g. better roads and education, it too may lead to economic growth by decreasing the cost of production effectively shifting the production function up. If, however, increased government spending does not increase the public capital base and thereby reduce production costs, economic growth will decline. If instead of increasing taxes or borrowing government finances increased G by increasing the money supply (Fig. 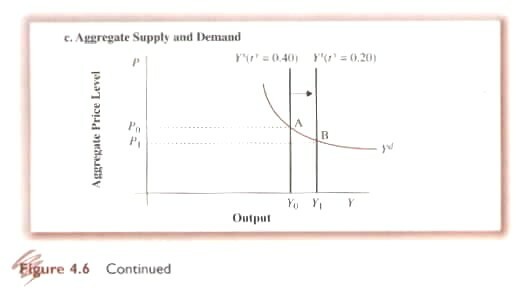 4.2, p. 65) prices will rise but aggregate output will remain unchanged. In effect higher prices act like a tax reducing private consumption and investment but matching such decreases by increased G.
To assess the differential impact of tax policy we shift from tax increases to reductions. We will consider both the demand- and supply-side effects of such a tax reduction. On the demand-side a decrease in taxes would increase disposable income thereby increasing consumption. If the tax cut was matched by a reduction in government spending to keep the budget in balance then there would be no further effect. The Classical Equilibrium would be maintained. If, however, the tax cut was not matched by a decline in government spending then a deficit would result requiring government to pay either by borrowing or increasing the money supply. If it borrowed then it would crowd out private investment by raising interest rates and the findings in (a) above would hold. If instead government financed the deficit by increasing the money supply then the results in (b) above would hold. The demand-side analysis essentially assumed that the tax reduction was a ‘lump sum’ decrease, e.g. every tax payer had his or her taxes reduced by $500. However, a tax reduction could take the form of a decrease in the ‘marginal income tax rate’. In this case the more you earned the more you would keep as disposable income. In effect this would amount to an increase in the ‘real’ wage. An increase in the ‘real’ wage (an increase not paid by firms) would increase the willingness of workers to work shifting the supply of labour (Fig. 4.6a, p. 75). 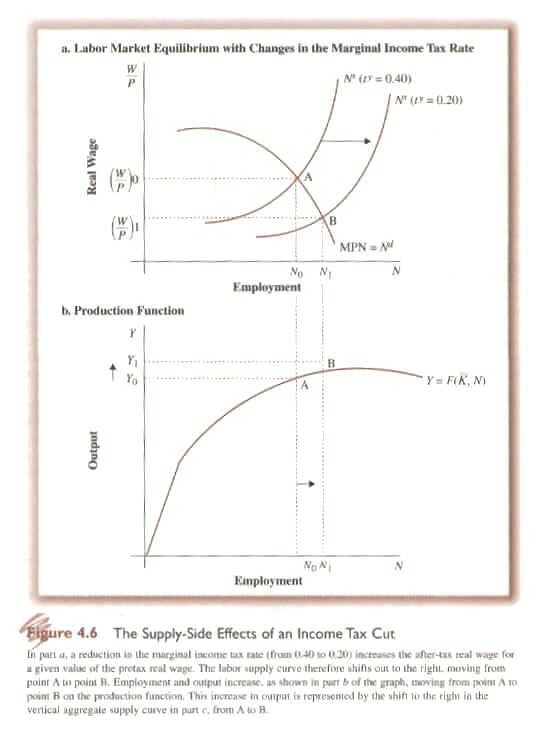 In effect this reduces the real wage paid by firms causing them to increase output (Fig. 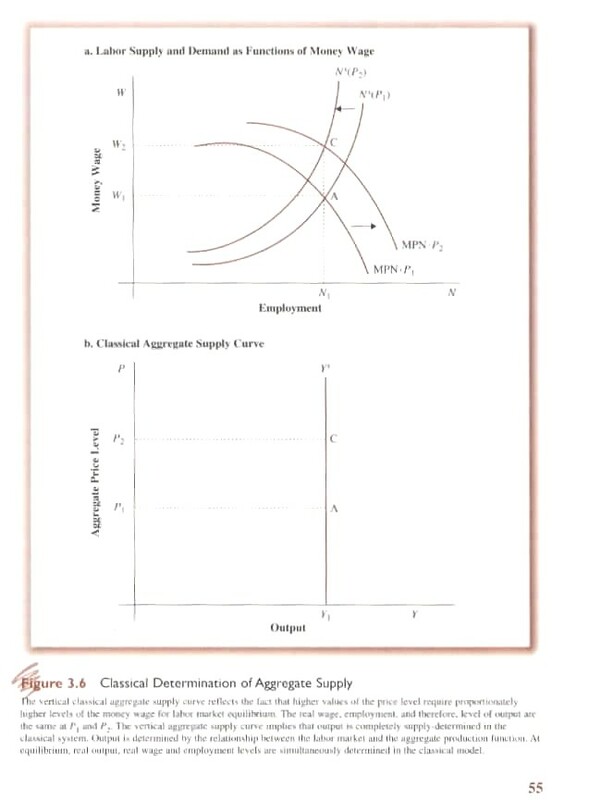 4.6b, p. 75) and equilibrium employment moves from N0 to N1 and equilibrium output (Fig. 4.6c, p. 76) from y0 to y1. As we have seen (Fig. 4.2, p. 65) in the Classical Model monetary policy has no ‘real’ effect. It’s importance lays in maintaining price stability and avoiding the disruptive effects of inflation. Every culture has a myth of origin usually set in a ‘golden age’ when everything was perfect. In the Judeo-Christian-Islamic traditions (the People of the Book), this was the Garden of Eden. Human beings were created in God’s image and intended to live in perfect harmony with God, nature and each other. Eventually, of course, a serpent appeared and humanity was expelled from its mythic bliss. · in the short-run at least, capital stock of plant and equipment was fixed as was technology and population. Change was smooth and clean; there were no ‘rigidities’ to inhibit maintenance of perfect ‘equilibrium’. But, as in the Eden myth, there was also a ‘before time’, a time when only God and his angels existed and when evil first appeared. For the Classical Model this was the Mercantilist period when kings, queens, princes and princesses awarded monopolies for domestic production to a favoured, pampered few and fixed the price of imports allowing their vassals to grow rich and fat while ‘the people’ sweated and starved. It was the time when the Prince of Darkness and his minions appeared – government and monopolies. · true uncertainty existed that could not be mathematically modeled nor probabilistically predicted causing, from time to time, shocks from which there was no guarantee that equilibrium would be regained. And Keynes’ solution: macroeconomic policy administered by a national government democratically elected by the people. And it is to this ‘Keynesian Model’ that we will turn in the next part of this course. Before doing so, however, I want to draw your attention to the work of two other economists who also critiqued the Classical Model but who did so from very different perspectives from each other and from Keynes – von Hayek and Schumpeter. Friedrich August von Hayek (1889-1992) argued that ‘perfect knowledge’ was not possible because there were two distinct types of knowledge that played a critical role in the economy. These were ‘scientific’ or what the OECD now calls ‘codified’ knowledge and practical or what the OECD now calls ‘tacit’ knowledge that only the ‘man on the spot’ could know and act upon. The first could be known to everyone; the second could not. Accordingly, attempts by central planners – whether socialist or Keynesian – to mathematically model and thereby control the economic process would lead to disastrous results. Hayek instead placed emphasis on the ‘price system’ which he considered to be not merely "rates of exchange between goods", but rather "a mechanism for communicating information" (Hayek, 1945). According to Hayek, the price system was a human institution that had evolved without conscious human effort and which allowed a condensation of practical knowledge that has caused the rapid economic growth and development of human civilization in the last few centuries. Joseph A. Schumpeter (1883-1950), by contrast, argued that economic progress was not the result of some mythic perfect competition but rather of ‘creative destruction’. Essential it was technological change that had caused the enormous growth in output over the last few centuries and the principal vehicle of such change was not the ‘competitive’ but rather monopolistic practices. In summary, ‘excess profits’ earned by large enterprise permitted them to invest in research and development leading to the wave of innovation that has characterized the modern and the post-modern economy. He also noted, however, that this process of creative destruction also ensured that large existing enterprise would, more times than not, be displaced as the waves of creative destruction flowed through time. “There may be few instances in which the superstition that only measurable magnitudes can be important has done positive harm in the economic field: but the present inflation and employment problems are a very serious one. Its effect has been that what is probably the true cause of extensive unemployment has been disregarded by the scientistically minded majority of economists, because its operation could not be confirmed by directly observable relations between measurable magnitudes, and that an almost exclusive concentration on quantitatively measurable surface phenomena has produced a policy which has made matters worse.